The artworks in Kesha Bruce’s “Weapons for Spiritual Warfare” are a form of ancestor worship. Each one of the tradition-rooted pieces in her Morton Fine Art show is “an answered prayer,” writes the African American artist, who divides her time between the United States and France. 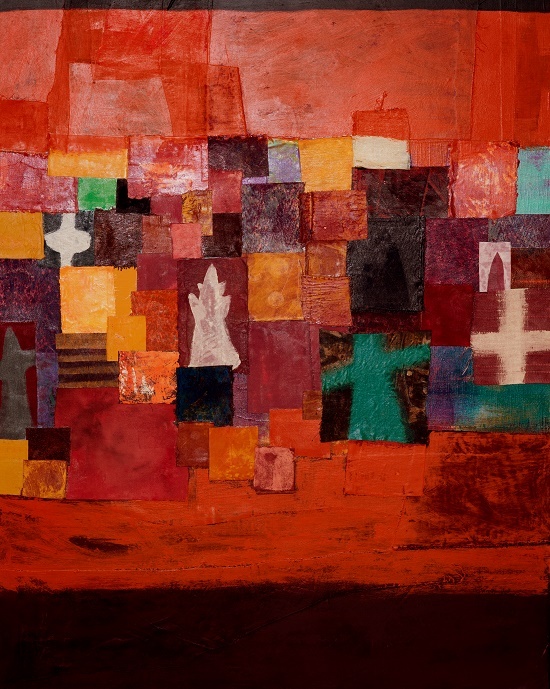 Most of these collage-paintings are small and consist of four rough-edged fabric squares daubed with simple geometric forms. The X, Y, + and # shapes are elemental, but rendered loosely to give evidence of the artist’s hand, as well as offer a sense of spontaneity. The largest and most complex are “The Sky Opened for Her,” which is cross-shaped and fringed with streamers, and “Between Starshine and Clay,” whose top third consists of overlapping black squares. The former resembles a ceremonial robe, while the latter evokes a sweeping view of a village under a nighttime sky — a universe conjured from tattered scraps and unstudied gestures. Reviewed by Mark Jenkins, March 1, 2018. Kesha Bruce: Weapons for Spiritual Warfare Through March 7 at Morton Fine Art, 1781 Florida Ave. NW. 202-628-2787. mortonfineart.com. Please follow the hyperlink to visit our website for all available artworks by KESHA BRUCE, and contact us here at the gallery for additional information or acquisition details. ‘Bleeding Art’ an interview with Maya Freelon Asante written by Shelley Rose featured in American Lifestyle Magazine Issue 87, 2018. Please contact us here at the gallery by emailing mortonfineart@gmail.com for a PDF readable version of this article as well as additional information and images. Available artwork by MAYA FREELON ASANTE can be viewed here on our website. It’s not only the predominantly gray palette that gives Julia Mae Bancroft’s artwork a ghostly feel. The mixed-media pictures in her Morton Fine Art show, “Mending Moments,” feature old-timey houses and interiors. Arrayed inside are women in long dresses, sometimes with faces transferred from vintage photos. The Virginia-bred D.C. artist graduated from the Corcoran College of Art and Design only a few years ago, yet seems fixed in an earlier era. The “mending” in the show’s title refers in part to Bancroft’s use of embroidery. She stitches as well as draws and paints, working thin, white strands into compositions that sometimes also incorporate layers of paper pulp. 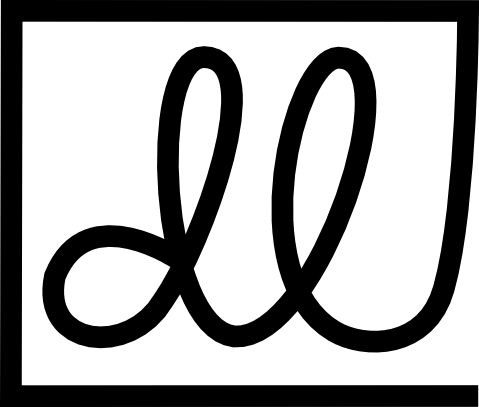 The threads can be abstract elements or represent literal things, such as human hair. The vertical strings that cloak “Moonlit Overcast” suggest both hanging moss and the mists of time. The effect can be spooky. The subject of “Sitting in Her Empty Chair” has a indistinct face and a clawlike hand. “Reverie,” the most 3-D piece, is built upon an iron grate with a tombstonelike shape. Bancroft, it appears, doesn’t merely ponder the past. She actively disinters it. Julia Mae Bancroft: Mending Moments Through Jan. 4 at Morton Fine Art, 1781 Florida Ave. NW. 202-628-2787. mortonfineart.com. Available artwork by JULIA MAE BANCROFT as well as her artist bio with statement can be found by following the highlighted link to Morton Fine Art’s website. Please contact the gallery for additional details. Sonya Clark, Seven Layer Tangle, 2005,plastic combs, glue, 7 x 30 x 30”. Maren Hassinger’s Love, 2005–12, in the far corner of the gallery, displays inflated hot pink plastic shopping bags gathered in the shape of an obtuse triangle rising up to the ceiling. It is impossible to see Love and not think of the collective progress made by the gay rights movement that has used this symbol of a pink triangle since the 1970s, as well the individual acts that went into shaping the movement. The allegorical use of materials continues in Sonya Clark’sPlain Weave, 2008—a simple, elegant grid of gold-colored thread and black plastic combs held together in the royal kente cloth pattern––elevating throwaway objects by using them to represent this coveted textile. Such are two instances of the ways in which Chakaia Booker, Maya Freelon Asante, Martha Jackson Jarvis, Joyce J. Scott, and Renée Stout, in addition to Hassinger and Clark—challenge the social and cultural identities of objects, blurring the boundary between natural and industrial materials. 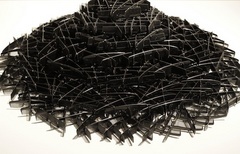 Take, for instance, Booker’s contribution: masses of recycled rubber tires––some sliced into strandlike lengths, others cut to sharp, pointed, staccato shapes––elegantly manipulated into long sculptural tableaux or smaller, compact works that allude to organic material and figuration. Whereas irrefutable power, speed, and performance dominate the commercially driven affect of automobile tires, Booker’s use of these discarded, visibly worn wheels––in tandem with her subsequent manipulation in composing her sculptures––speaks to a range of experience by showing the tangible effects of the environment on the objects. It is in this way that “Material Girls” spurs a consideration of the desire for newness in commodity objects and stakes a claim for finding value in the materiality that marks our experience, in spite of its monetary equivalent.